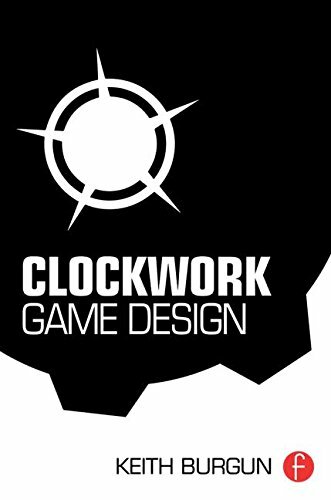 Clockwork Game Design is now available for pre-order! For the last year or so, I’ve been working hard on a book called Clockwork Game Design. It details a clear, useful design pattern for building elegant strategy games. How does it differ from my first book, Game Design Theory: A New Philosophy for Understanding Games? Game Design Theory was very broad. It talks about the history of interactive systems design, it talks about other forms such as puzzles and toys, and it talks a lot about modern videogames and some specific problems with them. Clockwork Game Design is narrow and focused. It asks a specific question: how do we go forward with strategy game design? How do we make games that are significantly better than the ones we’ve made in the past? How do we make games that are not only easier to learn than existing games, but also have longer life-spans? The answer is in the Clockwork Design Pattern. The Clockwork Design Pattern is one that starts with a core mechanism – a basic action that is the primary means of interaction with the system. Supporting mechanisms support – but do not fight with – the core mechanism, and all of this is anchored by the Goal. The Goal is the ultimate expression of the core mechanism action. To the extent that designers are able to create depth and elegance, they’re already using elements of this design pattern without even necessarily knowing it. If you want to design strategy games, and you can only own one book on the topic, it should be Clockwork Game Design. Pre-order it now on Amazon.com!